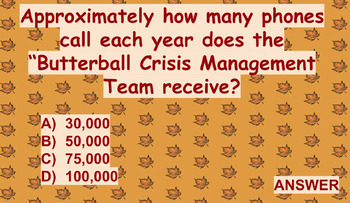 Do you know how many pounds the heaviest turkey has weighed? Do you know which President made Thanksgiving an official holiday or when the first parade started? 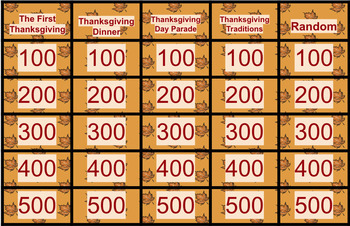 This Jeopardy game is a fun and educational activity for students made to teach them about the history and statistics of Thanksgiving in a fun and interactive way. It is in the form of Google Slides and is very easy to follow. It is compatible with a Smartboard so you can touch the PowerPoint like it is the actual Jeopardy Board. The link to the Google Slide is on the PDF that is attached. Enjoy! 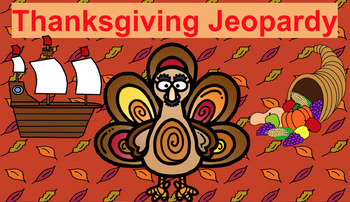 Want to prepare for the other holidays and save money on your Jeopardy purchases? Buy my Holiday Jeopardy Bundle Pack and get Jeopardy games for Thanksiving, Christmas, Halloween and St. Patrick's Day at a discounted price!